I'm excited to be entering my Farmer's Wife Quilt in Blogger's Quilt Festival Spring 2015, being hosted by Amy over at Amy's Creative Side. This quilt was almost exactly a year in the making, and is the largest quilt I've made to date. Quite honestly, I don't think I'll ever go bigger than this!! Its finished size is approximately 86" x 96", and I'm actually hoping for a bit of shrinkage once it goes through the wash! I enjoyed (almost!) 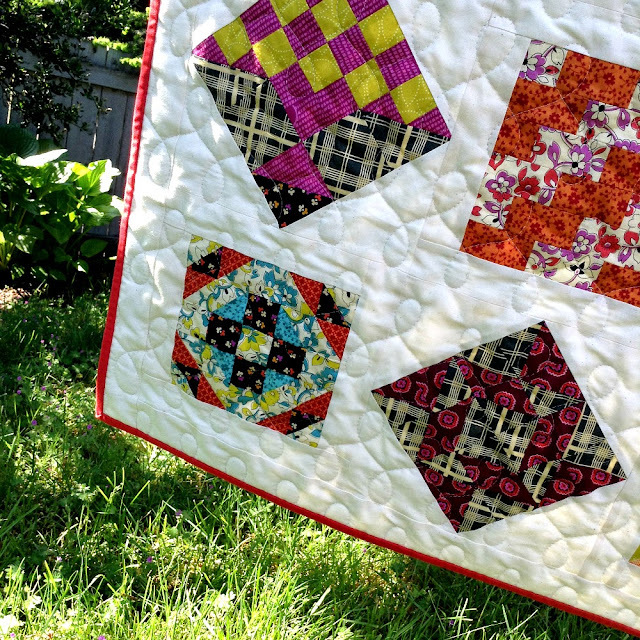 every moment of making the actual blocks, and working with Denyse Schmidt's Chicopee fabric line certainly helped! I love the bright colours and patterns in the fabrics that don't seem like they should go together, yet they do. I had Chelsea (www.chelseaquilts.com) do the quilting for me, knowing that I could never manage to work this beast through my normal household machine, and I'm so glad I did. She did a wonderful job. I used Carolyn Friedlander's Widescreen Crosshatch fabric for backing, which ended up being just wide enough to use without having to piece any other fabric into the backing to bring it up to size. Phew! I was relieved to not have to deal with that for such a big quilt. The binding fabric is Moda Bella Solids in Scarlet. 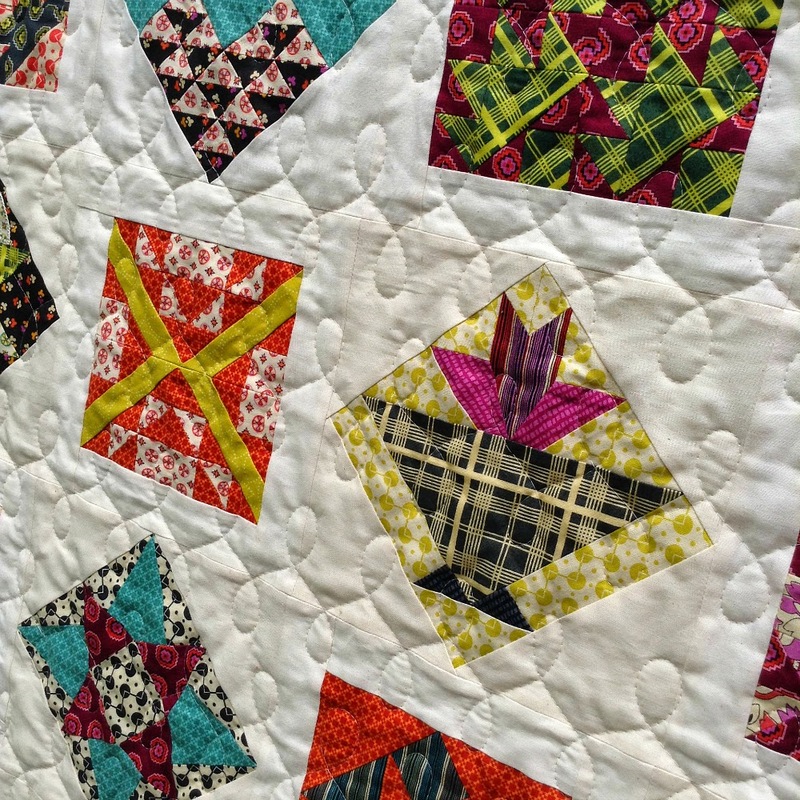 Thanks for stopping by, and be sure to visit the Blogger's Quilt Festival and check out all of the other entries in many categories. Have a great day! It's a fabulous quilt and so much work went into it! Love it! Amazing what modern fabrics do for the traditional design. Love this quilt with these fabrics! This is just gorgeous. What an awesome accomplishment, and your fabrics are absolutely perfect! Congrats Heather! I bet you're thrilled to have it done! I've been considering this setting for my Farmer's Wife blocks which are waiting in a pile. Seeing your beautiful quilt has clinched it for me. Nicely done! Wow! This is so gorgeous! What a wonderful and bold choice the Chicopee is. Yours makes me want to make a Farmer's Wife Quilt! So impressive! Beautiful quilt, the setting is really great. I know it's very laborious project, because in Poland is currently in progress draft joint sewing FW over the whole 2015 years. The more bravo !!! I take my hat off to anyone who finishes a farmers wife! I have made I think four blocks and some of them are deceptively fiddly. Kudos to you! It looks amazing! Almost, key word almost, makes me want to try one. I know I just wouldn't do it. But I love this!!! wow, amazing!! I love how you alternated on point and square. Brilliant. What a lovely quilt. I love the colours you've used. This is so perfect Heather! 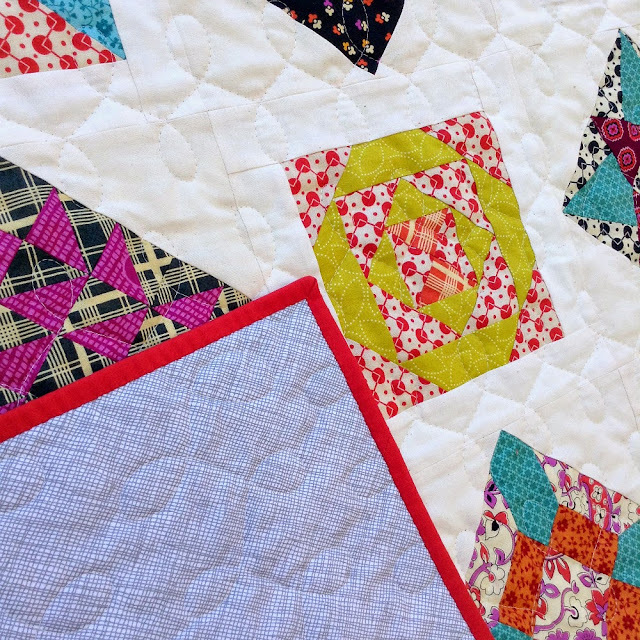 I love Chicopee and the retro feel it has, even with the very traditional blocks your quilt is so fresh and modern looking! The blocks look amazing and it was such a great combination. 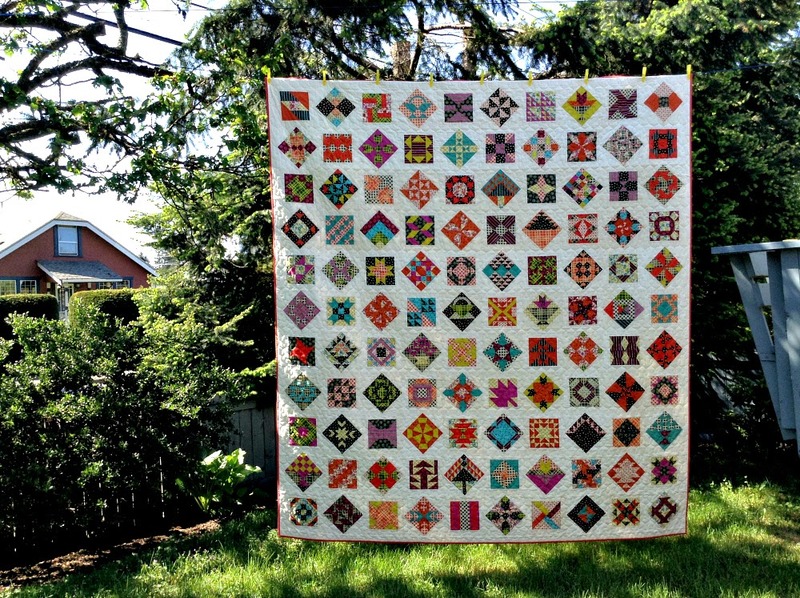 Beautiful quilting and you did the right thing, I couldn't face a big quilt on my machine either!! Beautiful Quilt..........I have the book but have not started mine. I have never seen one done with such bright colours.....I LOVE it.Congrats -- you should be so PROUD!! I can never get enough of this one, Heather! Good luck in the festival! I love your quilt and choice of fabrics. Can you tell me the collection you used? Always love to look at the choices made by others. Carol, I was unable to reply to your comment by email so I hope you come back here and check the comments. All of the fabrics I used were from Chicopee by Denyse Schmidt.